This term (Genjutsu) comes from Naruto and even if you’re not a fan of the series you probably have heard about it. A Genjutsu is something of the most basic things to understand in Naruto’s world. I won’t submerge you into complex things about it if you don’t know Naruto very well. Let’s start then by defining what is a Genjutsu. Illusory techniques (幻術 Genjutsu) are an advanced branch of ninja techniques (忍術 Ninjutsu) whose objective is to confuse the mind of the enemy by manipulating the chakra, that is, those techniques with which the user creates illusions. I consider the word Genjutsu as a cool way to say “something is deceptive about this”. And I’m talking for almost everybody in the room by saying that I don’t like to be deceived and prefer the truth even if it’s hurtful most of the times. I always like to dissipate the Genjutsu in my life and see things as they really are. I will now give you some examples of real-life cases in which a kind of Genjutsu is used toward someone you know or you and didn’t realize it at the time if you haven’t known the scenario with anticipation. 1 – When someone knocks at the door selling you a special offer of one of the best products out in the market and he simply convinces you that this is something that you must have, and you buy it, but you actually don’t have a real need for it. 2 – When a friend or acquaintance trying to convince you to do something (like lending some money) that you think it’s a waste of your time and energy (and/or money) because it won’t help them and won’t help you at all, but still you do it. 3 – Having a relationship of love and care with someone who is “ideal” to be with you because she/he presents you all the traits you like in a partner and you give all your trust, love and care to that person believing that person feels the same for you. But it wasn’t that “ideal” person after all. I can keep going almost endlessly putting scenario after scenario of Real-World Genjutsu examples but I think you already got the point and have enough amount of understanding to find and define some Genjutsus you’ve fallen for in your own life. With that said, shall we proceed to how we can get out of Depression’s Genjutsu? 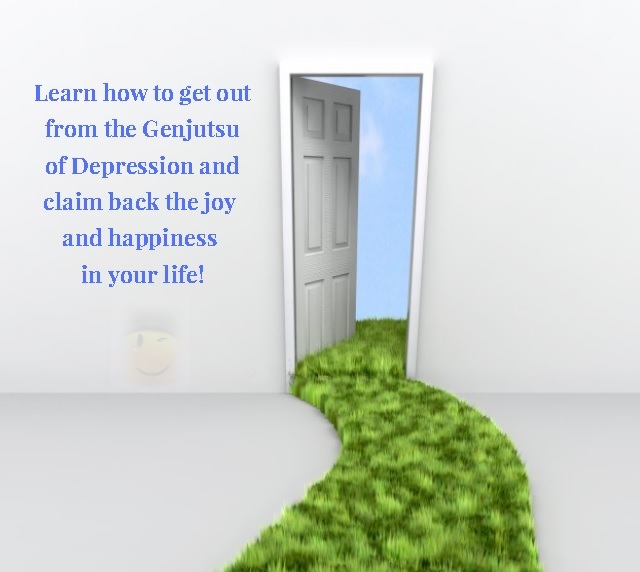 The Genjutsu of depression will be then the set of beliefs and misconceptions that we think are the truth in us and are truly false. In the anime, there are 2 ways to get out from a Genjutsu, one is that someone else infuse a little chakra (life force) into us with a touch and the other is by realizing none of what we’re experiencing is real and mind-bend the fallacy we are under with a more accurate representation of reality. 1 – Having someone who infuses into us a little of his “life force” by caring and showing us that the deception we are believing is not more than that, a deception. 2 – Doing our best effort to change our mindset and actually changing it to the right one. This is a great strategy anybody can have to beat depression but is the one that requires more effort and hard work from us. Now, everybody knows that it isn’t that simple to kill depression in this way but will mean a lot and for someone under severe depression will do all the difference having someone caring and supporting them because they will find more easily the drive to change their mindset to get back their lives. A combination of both ways, meaning that having someone who cares and giving our best all the time on thinking, acting and believing that we deserve to be happy is the best way to beat depression and getting out of its Genjutsu. Also, remember that this is not a magical cure and won’t happen overnight, keeping this in mind is crucial. You have to do the work like anything meaningful and worthy in life.